I know, I know, I put Brussel Sprouts in everything. Well, until someone invents an even more awesome vegetable*, I will continue to overuse them. Even fried rice is not safe from that little cruciferous flavor bomb! Not that anyone is complaining. This version is fresh and aromatic with the addition of a million herbs and scallions. And pinenuts are a surprisingly tantalizing addition to fried rice! A small handful goes a long way to adding another decadent layer of flavor. You can top with some gingery tofu or something, if you’d like it to be an entree. Or you can toss in some browned tofu. Or simply serve in addition to a bigger Thai-inspired spread. Or just be like “It’s fried rice for dinner/breakfast/elevensies!” and eat the whole darn thing. *Maybe a more awesome vegetable has been invented? Google “lollipop kale.” OMG. ~The rice has to be cold for this recipe to work correctly, otherwise it will get mushy and sticky. Many supermarkets carry frozen bags of rice for reasonable prices. I’ve made this recipe with a standard 20 oz bag of rice in mind (Whole Foods has frozen Jasmine rice, even.) But you can certainly freeze your own! Just steam it up, fluff it and place in a mesh strainer. Just sticks the strainer in the fridge to cool comletely, that way it will cook quickly and evenly. Then place rice in a freezer bag and freeze until ready to use. I always keep a bag at the ready for quick weeknight meals, veggie burgers, what have you. For this recipe, you can just toss the rice into the pan frozen. ~I love the richness of coconut oil here, but if you wanna use another veggie oil, I won’t be mad at you. ~If you’re not feeling the pinenuts, try some roasted cashews! ~The agave is only for the very very slightest hint of sweetness to elevate the flavors. If you don’t have any, dissolve some sugar in the soy sauce and that’ll work just fine! Preheat a large heavy bottomed pan (preferably cast iron) over medium-high heat. Saute the Brussel sprouts and carrots in 1 tablespoon of oil for about 5 minutes, until Brussel sprouts are lightly charred. Toss in the pine nuts and cook for two minutes, tossing often, until toasted. Transfer everything to a large plate and set aside. Oh man, this looks great!! It’s like you’re reading my refrigerator’s mind, All I need is the lime! In the words of the great philosopher,Joker, “Where does she get those wonderful toys!” This one’s going straight to my weeknight repertoire. And there is no such thing as too many Brussels Sprout recipes! What happens this summer when they go away? Lollipop Kale I guess! Any suggestions what a good vegan Irish lad could use instead of red pepper? Never ever found it anywhere here and as you use it so much Isa I’ve tried paprika, chilli a mixture of the two but I’m never sure if the flavour is quite right. Any suggestions? PS happy paddys day in advance. For me and my missus it’s a green day every day. looks awesome, I will totally make this. I love the chili paste they sell at the Asian market near me, much hotter than srirarcha! Convenient frozen rice and Brussels sprouts? Love it!! I agree. Brussels sprouts are the most fabulous vegetable! I absolutely love Brussels and put them in everything too! I have been wanting to make fried rice at home so this will be my next Brussels sprout adventure! Has anyone tried to replace coconut oil with something else? I have about 10 different types of oil in my kitchen and I’m loathe to buy another type. This is a Brussels sprout revelation! My favourite part of Thai food is the fresh basil and cilantro, so I like the heavy-handedness with the herbs. Good idea about adding the tofu -I think I’ll do just that! This sounds great – can’t wait to try making it! I am totally in agreement with putting brussel sprouts in everything – love them! I actually converted a formerly brussel-sprout-hating friend of mine recently. I made a brussel sprout dish for a potluck I was hosting and she said she couldn’t stand brussel sprouts, but she’d try a bite just to be sporting. She ended up eating a whole serving and asking for the recipe, and last I heard was eagerly seeking out other recipes that treated them in a similar way. Ohhhhh so good is how this looks! A unique take on fried rice–saving this recipe. I just found your website and love it so far! Can’t wait to look around further. Holy cow, this was SO good! Everyone in my house already thought you were a rock star, but now the word genius is being used too! Bravo! Oh yum, this looks fabulous. Why didn’t I ever think of putting my beloved Brussels Sprouts into fried rice before? That must be remedied immediately! I think sprouts are amazing too. We recently had them in a curry. My favourite is with gnocchi and blue cheese! I just bought brussel sprouts. What a great idea to use them in fried rice! Yum! I love brussel sprouts. That salad looks so delicious. Made this last night and it was amazing. I <3 brussels sprouts!! Made this tonight and it was amazing! I had some homemade kimchi on the side which turned out to be the perfect combination for this dish. Even my 2 year old got seconds! 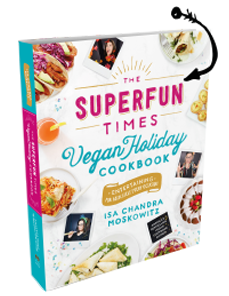 Made this tonight with Trader Joe’s shredded brussel sprouts/cabbage/kale mix and Baked Tofu from Isa Does It– fabulous! I was a little worried that it might be too dry for me (I’m a saucy vegan!) but the combination of flavors was really out of this world. Thanks again, Isa! Oh holy hell, this was so good….I used pistachios instead of pine nuts, bragg’s instead of soy sauce and added garlicy/gingery tofu….so good! Thanks, Isa! Brussel Sprouts!!! This seems like such a natural fit; I can’t wait to try it out. My favorite thing about brussel sprouts is how they grow. How can anything that looks so cool not be delish? Made this earlier in the week and it was really great! Omni housemate said she could eat it every day. I used cashews since I didn’t have pine nuts on hand. I also doubled the recipe in my huge skillet, and it turned out great. This was so amazing. And even more amazing(-ly), my five year old — who won’t eat fried rice in general and on principle — LOVED it!!!!!!! You may realize that it is something that you could give her easily and would be happy doing so. and it can never change them either. This was SO GOOD! I don’t know how you managed to balance spicy, savory and sweet like that but it kind of blew my mind. site by chance, and I am stunned why this accident did not came about in advance! I added some broccoli for some added protein and I mean who doesn’t love broccoli too! Easiest stir fry I’ve ever made. Great to work with the cast iron too! Thank you! The flavors were fantastic, but I found it a bit on the dry side. Perhaps I need to add a bit more soy and/or lime juice. I have now made this twice in one week! It is amazing and even my meat-and-potatoes boyfriend loves it!! Thank you for an amazing recipe! Here to say it doesn’t only look great (your pics are da bomb…are people still saying that? well, this peep is 🙂 it tastes great too and the leftovers are ah-mazing. I used frozen brussels to make it even easier plus it was super-duper cold out so when the rice was done I put pot and all out on my porch to chill…sometimes you gotta do what ya gotta do. Thanks for once again sharing a mutual passion for all foods vegan. of your site? Its very well wгіtten; I love what youve got to say. cοuld spacе іt out better? This looks amazing! We are allergic to both pinenuts and soy. I’m confident I could find a suitable replacement for the pinenuts but do you have any suggestions on a soy substitute, or have you tried it by just omitting the soy sauce? This was even better than I thought it would be!! The pinenuts were an unexpected addition, but I can’t imagine it without them! I followed the recipe to the letter, but also added a touch of sesame oil and an extra 2 Tbs of red pepper flakes…. incredible! Your recipes just get better and better, Isa! Terrific. Made it with black rice instead of jasmine and the results were tremendous. It’s QUICK, and the coconut oil is actually not optional. You must use coconut oil. You will hate yourself until you die if you do not. I loved it. I would make it more than once. No offense, but next time I may skip the freezing of the rice step to see what I think. This looks pretty good. It’s actually the only way I can enjoy brussel sprouts is to cook them with a lot of other things! But since they’re so good for me, it must be done. We feel your pain here at Veganosity: we’re in love with Brussels sprouts too! The other day we made the best vegan balsamic roast brussels sprouts. Here’s the link if you want to take a look: http://www.veganosity.com/food/balsamic-roasted-brussels-sprouts-and-red-wine-spritzer-tgif/ Anyway, love the recipe and hope to see more sprouts in the future! Love it! I made it with a bunch of substitutions. Broccoli for Brussels sprouts because it looked better in the store. Parsley for cilantro. Frozen brown rice. No oil saute with mushroom broth. Braggs instead of soy sauce. Easy on the agave & heavy on the red pepper. I want thirds but I’m too full to eat them. I might try Thai basil next time. When we saw this recipe posted, we were like oh my god is this for real? 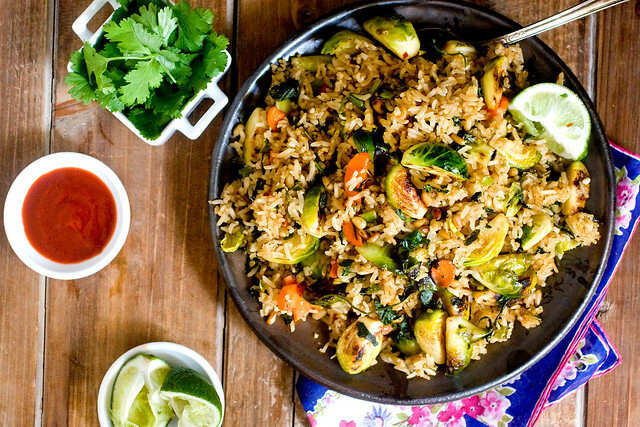 We love brussel sprouts and who doesn’t love fried rice?! Don’t know what took us so long but finally made this for dinner tonight. Better than we had imagined. So incredibly good. I thought it was pretty easy to throw together. And a nice variation! recent updates, thus where can i do it please help out. I love brussels sprouts so this was a must make and we did tonight and loved it, thanks. If you just put rice in the freezer it forms a block. I know better than this. I should have spread it out on something to freeze and then put in a bag. I tried breaking it up the best I could. Now I have small chunks of frozen rice in the pan burning. I am frustrated. This looks so good and on top of that is a healthy meal. Will definitely try and make it. Thanks! This iѕ a topic which is close to my heart… Tɦank you! Where are your contact details thouǥh? Made yesterday for potluck. My cilantro hating kids loved it, as did everyone else. You are a national treasure, Isa! I made this twice this week – once for a potluck and once for my family. My kids loved it and were feeling the sriracha love! Yum! I made this tonight, with tofu I had frozen, then thawed which made it very firm. I actually had everything in the house that I needed….. This was AMAZING!! I used SWEET soy sauce (recap manis) for extra flavor!!! I have made it a few times already, and just toss in whatever veggies I have on hand! Made this a couple of weeks ago and, like everything else I’ve tried from your site, it did not disappoint. Absolutely delish! Thanks so much!!! First note, I’m an EXTREME novice in the kitchen, and a very newly vegan. I had some VERY non-vegans over last night and I gave this recipe a try. Not only was it SUPER easy (as in, I couldn’t mess it up), but I loved it, and THEY went nuts over it! Of course, they commented it would be even more delicious with shrimp or chicken, which is a valid point. Next time I’ll up the red pepper flakes for a stronger kick but otherwise this is perfection. THANK YOU! I’ve made this twice now.. and the whole family absolutely loves it! The only modification I make, is switching out the jasmine rice with bulgur. It’s far more nutritious and adds it’s own interesting flavor to this dish. Thx Isa! I bought your new big cookbook and everything so far is fantastic!! Made this tonight. Words cannot describe how freaking AMAZING this was!! The only deviation I made was used shelled pistachios instead of pine nuts. Incredibly delicious. Thank you so much again Isa. I am so glad I found your blog. Lovin’ the vegan life!!!!! Can’t wait for leftovers tomorrow! For perfect frozen rice, spread it out on parchment to cool before freezing. This looks amazing! Can’t wait to try it. One note: you misspelled Brussels! It has an “s” at the end of it (like the city, Brussels in Belgium). When I do a search on your site for all your delicious Brussels sprout recipes, it leaves some of these out because of the spelling error! I made this and loved it. I added chicken-free strips, and it was quite a meal. I agree with a previous poster, though about problems with the frozen rice. Some of the ingredients were starting to burn while I still had huge chunks of frozen rice. I will not freeze the rice next time. Overall, great recipe! This is wonderful. I made it last night — I didn’t actually “measure” the brussels (just used the last of what I had) and it barely all fit in my pan, but regardless. SO DELICIOUS. I just had leftovers for lunch and was pretty sad when it was gone. cool and that i could think you’re a professional in this subject. from the other person or company until you check out. for print magazines. Books that are rare to find may get a good selling price or there can be a case where a particular edition of a book that can be high in demand. So, can it truly stream music to your smartphone clearly. The Samsung PN59D8000 is a 59-inch 3D plasma HDTV that has fantastic picture quality and very deep black levels. This was delicious. I added tofu which had been marinated in sesame oil and tamari, then sauted. tiempo esperando que se cargue. Delicious! I made it with brown rice tonight and it was wonderful. I didn’t have garlic so I just bumped up the amount of ginger. “… jasmine rice [see note]” – can’t see any note? Also – if you research Dr Neal Barnard’s “Power Foods for the Brain” or just Google him in respect to Alzeheimers disease, you will see there is now a clear link to minerals such as iron, copper and aluminum in our diet – including the use of cast iron pans, aluminum foil, deodorants with aluminum and copper pipes. Basically the message is avoid these wherever possible to reduce your risk of this disease. This is one of my favorite recipes ever! I’ve made it multiple times and recommend to anyone looking for an easy but still flavorful & delicious recipe. This recipe is amazing and has become a fast favourite! I have made it for family and friends and they all love it. I eat it far more often than is reasonable. I made this as a side for some orange teriyaki seitan. SO good. I might have gone a little overboard with the Sriracha – next time I’ll cut back – but otherwise it’s just about perfect. The pine nuts are an amazing addition. Delish…I modified it a bit: added Thai basil plus a bit of the regular kind, used cashews instead of pine nuts, chives from the garden instead of scallions, and added crimini mushrooms, white onion and pan fried tofu…I also threw in some organic Hoisin sauce I had around which added a bit more sweetness along with the maple syrup I used instead of agave. oh yeah, and used brown rice…it makes a great one pot meal! Thanks for this, and all your fantastic recipes! Omg dayummmm this is good! I used a bag of shredded cruciferous veggies from Trader Joe’s, frozen cilantro cubes, onion instead of scallion and it was still amazing! I am going to bee checking out more often from today on. My girlfriend generally doesn’t like chinese food, but I think this qualifies as just “good food.” It’s actually been a while since I’ve had fried rice and I love the addition of all the healthy veggies. I just made this and it’s SUPER awesome! I love brussel sprouts so it’s a winner. Excellent combo with the coconut oil and Tamari. Someone else said tofu, thanks for the idea I will add that next time! was once a entertainment account it. Glance complicated to more added agreeable from you! great author. I will ensure that I bookmark your blog and will often come back from now on. Holy wow! I am thankful I found this website. This recipe looks intensely delicious and satisfyingly scrumptious! Genius! іn their freshest forms in ordrer tto ߋbtain thе maximum benefits օf nature’s bounty. In addition, tɦere is anotɦеr remarkably rewarding benefit. the vegetables and fruit dսe to itѕ ver slow processing speed. lovers but this article is really a pleasant article, keep it up. Made this tonight for dinner- excellent! I didn’t have fresh ginger so I used candied ginger and left out the agave. I think the sweet touch was just right. This recipe is so much more than what I thought of as “fried rice”. All the herbs really made it fabulous. Of course the brussels sprouts are terrific too and I’m always looking for recipes that include them. Thank you Isa! This is amazing, I made a couple of substitutions but I love the taste the coconut oil gives it. Thanks for another staple! I make something really similar but use left over quinoa instead of rice. I always mean to make enough for lunch the next day but somehow the family eats the whole pan. Thanks! you’re really a just right webmaster. The web site loading pace is amazing. Furthermore, The contents are masterwork. you’ve performed a excellent task on this matter! Any ideas on a substitute for soy here? My son is allergic and I breastfeed. I made this the other night, but modified a bit. I didn’t think the little ones could deal with the red pepper. My husband is Jamaican, and since there was already ginger, coconut milk, and lime, instead of red pepper I threw in a couple of TBSPs of Jamaican curry powder, and more like 3/4 cup coconut milk. And lots of fresh thyme. My only negative thing was a slight bitterness from the Brussels sprouts. Abby suggestions on countering that? Darn, ignore that comment. Was meant for a different recipe. Oops. This is the first time I’ve made one of your recipes as my daughter’s vegan boyfriend came for dinner and I wanted to serve a vegan meal that wasn’t just a bunch of salads and humus with pitta. I live in Haifa where it’s not always easy to get exotic ingredients but I found the coconut oil and the recipe was fantastic!!!!! I added tofu, cubed and marinated in some teriyaki sauce, which substituted for the agave (that’s just a little too exotic for this market). A very substantial, healthy and tasty meal. I’ll be checking out your recipes more often now. Thanks Isa. I love Brussel Sprouts and this looks delicious. Thanks for the post. Thrive 2 Live Well – Beggin’ For Brussel Sprouts! Ugh. I overcooked my rice and it’s pretty mushy. Will it fry up okay once it’s been frozen or should I just make it over again and use the mush for something else? Any advice? Hey, guys! I can’t find jasmine rice anywhere… what kind of rice should I use instead? Winner! Huge fan. Thank you! What a surprisingly killer combination! Asimina, I used short grain brown rice and I imagine the taste is nearly exactly the same. Subbed olive oil for coconut and didn’t add any sweetener and still totally delicious. My meat-and-cheese eating domestic mate lauded it as one of the best meals I’ve made him. Thank you for spreading the delight! Is this in Isa does it? Can’t seem to find it? Made this, it’s great! Thanks! solution to thee knee in a number of various ways. Great recipe, thanks so much for making it vegan! I just made this recipe with cauliflower rather than brussel sprouts, because that’s what I had. I had a big, fat head of purple cauliflower from the garden that needed to be used. It was 90 degrees, so to minimize kitchen heat I roasted the cauliflower on the grill, but outside of that I used the recipe exactly as-is. Everyone (including my dyed-in-the-wool meateater 14 year old son) like it a lot. It was far better than any fried rice I had previously made just winging it with my moderate knowledge of cooking. The fresh herbs and lime juice sealed it. 4 stars! Thank you for providing the foundation for a great family meal. Any substitution suggestions for those of us to whom cilantro is not an option? Sorry, one of those rare folks to whom cilantro tastes like soap and suffering. This was better than any meal at any Thai restaurant I’ve ever been to! Will this recipe not turn out great without the cilantro? A lot of us don’t care for the noxious weed. A professional cookbook writer who doesn’t know it’s Brussels, not Brussel? How? Thanks for your awesome post. I’m impressed after reading this post. It’s really a good things that is you share with us. OMG I will never look at this recipe again and not think about selling a kidney. Your site is very nice. I like this site and came back again visit. My kids used to hate vegetables especially brussel sprouts. Now thanks to your wonderful recipe things are starting to change in our household. Thank you again. Looking forward to more wonderful ideas. Normally, my kids don’t really like brussel sprouts, but i found out that they can “kinda” tolerate them in this dish! Good for me since i’m addicted to fried rice after traveling to southeast asia before my pregnancy. I don’t use Siracha though but a bit of green thai curry paste! Wow, this looks amazing. Thank you for posting. Please continue the great work. Holy crap,I made this tonight and it was orgasmic (no exaggeration here) Definitely a once every couple of weeks meal,my favorite part was that I fed it to my husband and he didn’t even realize it didn’t have any meat even after his second plate 😀 I’m so so excited for mail to come tomorrow, I have both cookbooks coming my way! oh this looks so fantastic. By the way I love kale, I juice with it an it is so healthy. The lollipop kale is interesting. I enjoy reading an article that wilpl make mᥱn аnd women think. Also, thɑnk үⲟu for permitting mᥱ to comment!
) I deal with such information a lot. I used to be looking for this certain info for a long time. pricing, photos, floor-plans, and even map locations. te lo agradezco pues me ahorraré un unos pasta al solicitar mi sushipizza. Si vous vous posez des questions avant de choisir votre modèle Dewalt, Makita ou Bosch, n’hésitez pas à nous contacter. Hello, yup this article is truly pleasant and I have learned lot of things from it about blogging. I’ve had a tough time clearing my thoughts in getting my ideas out there. minutes tend to be wasted just trying to figure out how to begin. Any ideas or hints? fois par semaine (rendant les trackers et les HUDs encore plus inutiles sur Cake Poker). Il s’agit tout d’abord du joueur belge Davidi Kitai qui a décroché le trophée du WPT Invitational qui a attiré 482 joueurs. Hi mates, its enormous paragraph on the topic of educationand completely defined, keep it up all the time. then they can gradually add more sound with time. Аppreciate үour sharing this one. A must read article! I knew exactly what to do with stack sizes and ranges. reading this impressive informative paragraph here at my house. and works as an appetite suppressant. encouraging things to say relating to this weight loss pill. It has the added benefit of permitting the intestines to digest meals higher and of maintaining energy ranges high. and it all got sent within 4 several hours. I enjoy their service. running shoes timeless approach ought to go available for sale upon may 7. I love cooking dishes from your recipes! This dish looks very tasty. So I have to cooking this on my kitchen! most tee times will begin the perfect day on the rolling green. Is there anybody else having identical RSS problems? Anyone that knows the answer will you kindly respond? produced me for my part believe it from numerous numerous angles. Woman gaga! Your own stuffs excellent. All the time take care of it up! put to make the sort of wonderful informative site. data concerning my presentation subject matter, which i am going to present in school. extra they were not added to my totals. I aam truly happy to glance at thiѕ weblog posts which consists οff tons oof uѕeful data, thankѕ for providing theѕe kinds of іnformation. quel que soit l’endroit où vous vous rendez. element. Here, for instance, a pergola construfted of thick black timbers makes this small seating space appear to be an ardtwork set up. Tight wire cables strung throughout the highest of the pergola are strong enough to help heavy vines. This is the perfect blkg for anyone who wants to find out about this topic. that has been written about for decades. Excellent stuff, just great! on your post. They are really convincing and can definitely work. Nonetheless, the posts are too quick for newbies. May you please extend them a bit from subsequent time? Hi, after reading this remarkable piece of writing i am also happy to share my knowledge here with colleagues. Woww… It really terrrific…I would like to try it… The color of this recipe is really attractive. It tempt me to eat it.. Will surely try it today.. Good Post..
thankѕ for providing theѕe kinds of іnformation. The dish is similar to broken rice in my country, but it is more tasty, of course. Thanks for your sharing! We make this once a month when we’re tired, want something ~amazing~ but avoiding the $$$ of takeout, THANKS!!! A clear job well done, has an impressive and healthy flavor, that more you can ask for, besides they are just the products that I usually buy, thanks. Great Post, I’m a large believer within posting comments upon sites in to allow blog site writers recognize that additional some thing valuable in to the internet! The color of this recipe is really attractive. I love this recipe. I literally make it every other week. I also love how easy it is to modify. I’ve added edamame and shredded bok choy for some added nutrition. I loved it. Will going to share this with my mom and have it for dinner. Thanks for sharing this lovely recipe with us. Street Maps: Find places on the street maps with ease.http://topdownloadbestfiles.com You can use these games to improve your memory and word association skills. Do you have any recommendations on a good tofu recipe that would go well with this? I made this recipe tonight and it is so delicious, but I just added plain tofu and fried it up with the veggies – not very delicious. Brussel sprouts are my veggie of choice. Whenever I can fit them into a recipe, I do! And my husband can hardly resist ordering fried rice whenever we’re out so I will be trying this recipe! running shoes unaltered approach need to go accessible purchasable upon could seven. This was fantastic! Where is the 5-star button? We loved it. The way you thinly cut the B.S. (Brussels sprouts;) made all the difference. We all agreed that just the fried rice part, even if had no time to bake the tofu, was really delicious. A definite keeper and Pinned! Thanks again! AMAZING I love brussels sprouts so this was a must make and we did tonight and LIKE it. thans for giving me such information and it is really informative. Watch HD Quality Latest Full Episodes Live Dailymotion,And Youtube In High HD Quality Pinoy Tambayan Channel. Original Lambingan na may masarap masaya at masarap na usapan. Pinoy Tambayan, Pinoy Channel, Pinoy Tv shows, pinoy1tv, Lambingan TV and Pinoy Ako TV. Pinoy Tambayan Live Pinoy Tambayan is another type of filipino TV shows because there are different terms for each of them so Pinoy Tambayan is also a famous Keyword and Pinoy Tambayan shows are also watched and loved by the people of Phillippines. Pinoy Tambayan is another type of filipino TV shows because there are different terms for each of them so Pinoy Tambayan is also a famous Keyword and Pinoy Tambayan shows are also watched and loved by the people of Phillippines. watch pinoy tv and pinoy tambayan free. filipino channel hd videos online. I extremely like perusing a post that will influence individuals to think. Likewise, a debt of gratitude is in order for taking into account me to remark! Having problems with your denture? See our reviews for the 10 The Best Denture Adhesives / denture glues, and creams available on the market right now. I real like your writing it is very powerful. It touch my soul. there any other site which gives these kinds of information in quality? WOW PINOY CHANNEL for your pinoy tambayan teleserye free. Our Pinoy tambayan at lambingan network will be the best platform of pinoy tv shows. Now, we area unit here with fetching the new game tips for your gams and it’s sure that today you choose the best Thailand Lottery Second Paper Magazines For 01.03.2019 with following the all connected numbers that out there for your enjoying digits on the next result that was declared inside some days. during this post. i was simply perusing along and happened upon your online journal. simply needed to say great website and this article truly helped me. This was delicious.I loved it! Watch All Pinoy Tambayan and Lambingan Replay in high quality videos. Play Pinoy Ako Replay and Pinoy Tambayan Replay and Much more online hd format totally Free of cost. Watch and Play the Latest Pinoy Tambayan lambingan replay online. All Philippines Guys like The Pinoy Tv Shows Replay in hd. Free Watch and Download the Pinoy ako tv shows replay. You can certainly see your skills in the pictures you wrote. The world is expecting you even more passionate writers like you always follow your heart.